Who’s The Nation’s “Most Valuable Local Official”? 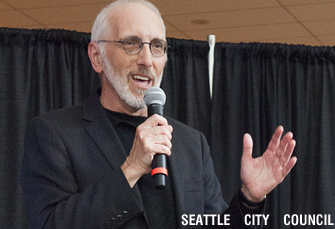 Congratulations to Seattle City Council member Nick Licata, who was named The Nation Magazine’s “Most Valuable Local Official” on the Progressive Honor Roll of 2012. The Nation cites his progressive credentials, including his sponsorship of Seattle paid sick days ordinance, as a reason for the award. Licata joined other progressive leaders like Sen. Bernie Sanders, and Rep. Tammy Baldwin, Vermont Governor Peter Shumlin, and Montana A.G. Steve Bullock, on the list. Congratulations to Nick on winning the award! This entry was posted in In the news and tagged nick licata. Bookmark the permalink.